eurodesk.tv hat einen rd. sechsminütigen Beitrag über den internationalen Jugendfreiwilligendienst erstellt und online gestellt. Für alle diejenigen, die Auslandserfahrungen nach der Schule sammeln wollen, ist das eine riesen Chance. Also reinschauen und aktiv werden. Viel Spaß. http://europexl.wordpress.com hat große Zugriffszahlen und auch die Presse und Partner berichten über das Projekt. Zum Lesen bitte hier klicken! Europa-Haus Marienberg aktiv im deutsch-polnischen Austausch – jetzt mit Nominierung! In diesem Jahr feiert das Deutsch-Polnische Jugendwerk sein 20jähriges Bestehen. Im Rahmen der Feierlichkeiten wurde auch das Projekt “Guter Nachbar” initiiert. 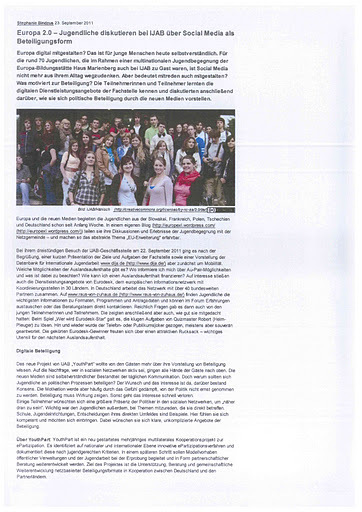 Die Auszeichnung “Guter Nachbar” wurde im Herbst 2010 anlässlich des 20-jährigen Bestehens des Deutsch-Polnischen Jugendwerks im folgenden Jahr ausgeschrieben. 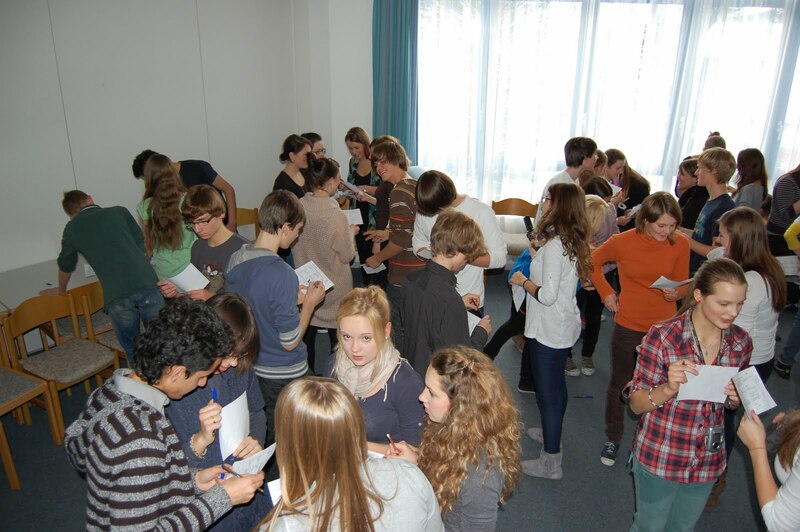 Bis Ende Januar 2011 wurden mehr als 700 engagierte Personen und Partnerschaften im deutsch-polnischen Jugendaustausch für die Auszeichnung vorgeschlagen. 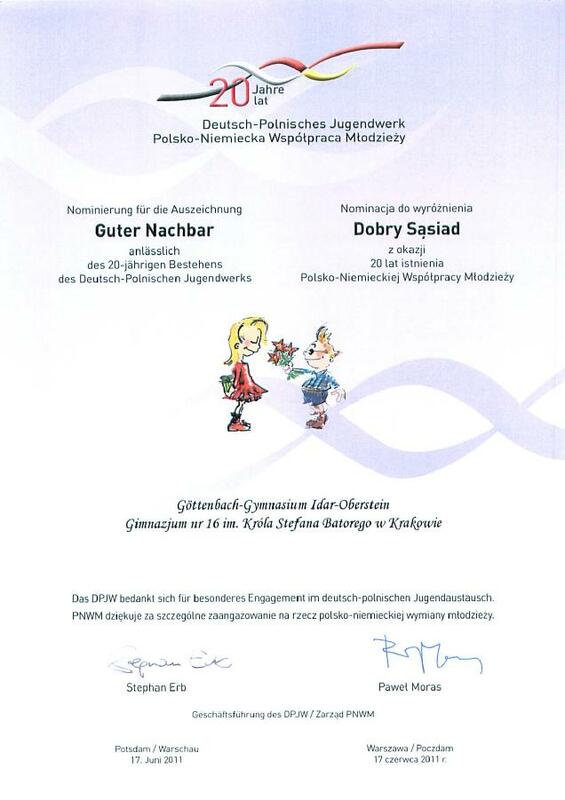 Gimnazjum nr 16 im Króla Stefana Batorego w Krakowie erlebete eine lebendige und aktive deutsch-polnische Jugendbegegung im Dezember 2010 im Europa-Haus Marienberg. Für den Dezember 2011 bzw. das Frühjahr 2012 gibt es Planungen für einen Gegenbesuch der deutsche Gruppe in Krakau. 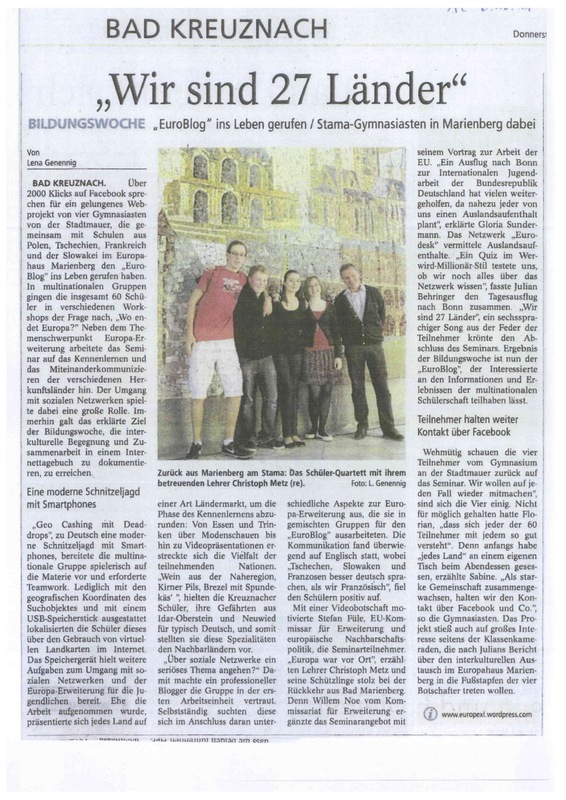 Karsten Lucke, Studienleiter des EHM, soll auch dieses Projekt wieder betreuen und die deutsche Delegation nach Krakau begeleiten. Das Europa-Haus Marienberg setzt sein erfolgreiches Engagement im Bereich der deutsch-polnischen Jugendbildung fort. Auch im nächsten Jahr wird wieder mit vielen vertrauten und auch neuen Partnern ein aktiver Beitrag im deutsch-polnischen Austausch geleistet. Dazu zählen neben der lebendigen Begegnung zwischen Polen und Deutschen vor allen Dingen der Aspekt des interkulturellen Lernens sowie der Sensibilisierung für die europäische Dimension. Deutsch-polnische Themen stehen ohnehin im methodenreichen Fokus der Arbeit. Veröffentlicht am 8. 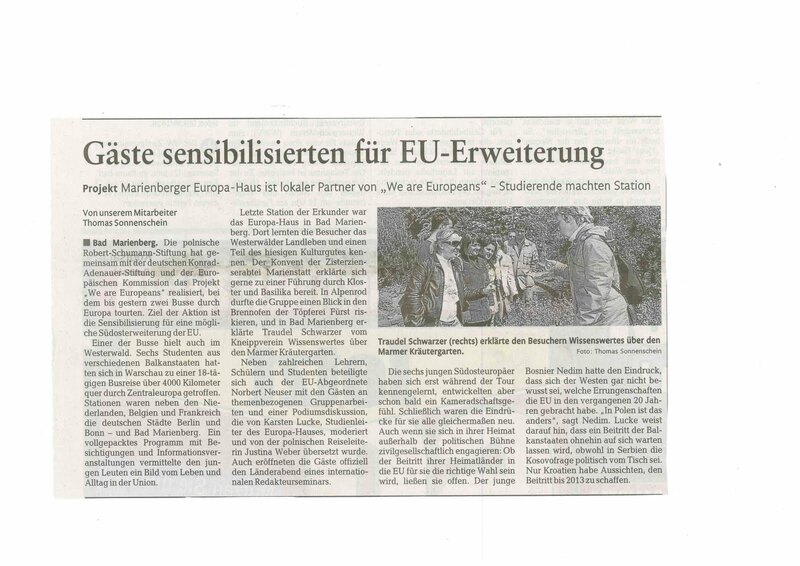 September 2011 Autor KarstenKategorien Binational Seminars, Press & Media reportsSchreibe einen Kommentar zu Europa-Haus Marienberg aktiv im deutsch-polnischen Austausch – jetzt mit Nominierung! After months of preparation, on May 02nd the Europebus with six representatives from different Balkan states finally arrived at the Europe House Marienberg. We welcomed young citizens from Serbia, Croatia, Bosnia and Herzegovina, Montenegro, Albania and Macedonia. The six started just before Easter from Warsaw to discover Europe, to bring Western Balkan culture to the EU and to discuss future enlargement of the European Union to the SEE (South Eastern European) countries. “We are Europeans” is that project called. The lead partner is the Robert-Schuman-Foundation in Warsaw. They came up with the idea and organised the whole project together with the local partner throughout Europe. 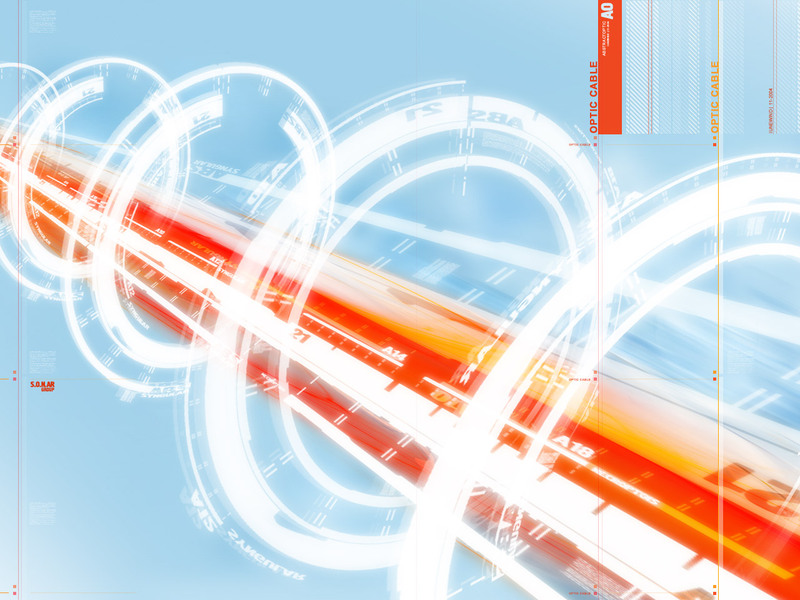 Also included in the whole project management is the Konrad-Adenauer-Foundation. 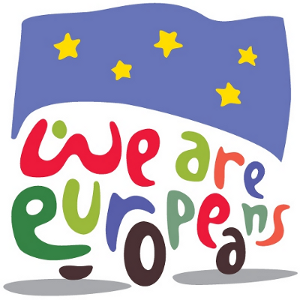 “We are Europeans” is supported by the EU via the PRINCE programme. Two busses with six representatives set out to discover Europe – one northern and one southern tour. The tour through the north of Europe started in Poland went through Germany and then drove along the Netherlands, Belgium and France to go back through Germany ending in Warsaw again. 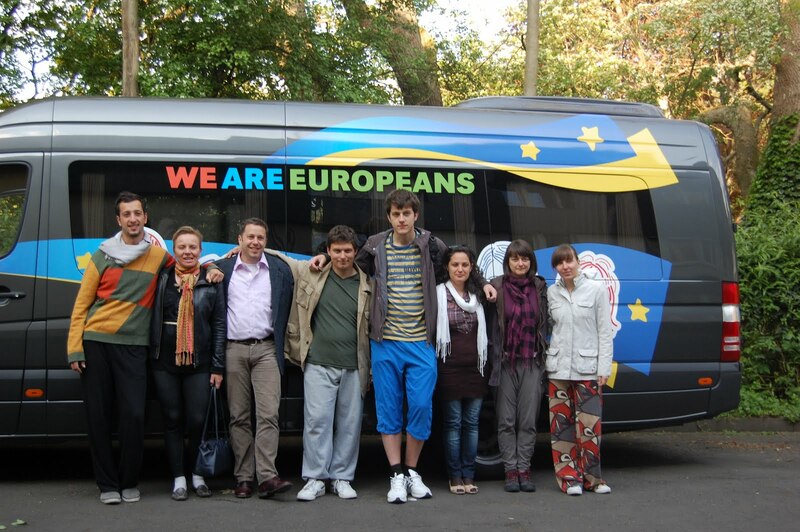 The last station before they went back to the final conference in Poland “We are Europeans” did stop in Bad Marienberg to visit the Europe House and have a colourful programme. The day the citizens from the Balkan stayed here was separated into three parts. During the morning we discovered the local area showing rural Germany to the participants. We did visit the Abbey Marienstatt, a local traditional pottery shop and a pharmacy garden including a barefootwalk with the local Kneipp association. After the lunch break we had a very good discussion forum about future enlargement to the Western Balkan. Young German citizens from schools and universities showed up as well as some teachers and representatives of local political parties. The MEP Norbert Neuser attended also – he just rushed from Brussels to Bad Marienberg to take part. It was a very vivid discussion. We crossed many topics and had also an active intercultural dialogue. Western Balkan citizens long for being part of the EU. But it is not so easy. You can’t say all the countries of the Western Balkan have the same attitude. As Serbia is getting more European every day you’ll find more and more critical voices in Croatia even when Croatia is the country which is most likely the candidate to become the next member of the EU in 2012 or 2013. Brain drain is also a phenomenon which concerns the citizens of the SEE countries. They need the high qualified people to rebuild their own country instead of loosing them to the current EU members. A lot of things have been discussed and as always it is not just black and white. The discussion about the future enlargement is very complicated and multidimensional. “We are Europeans” is a project that helps to have a qualitative discussion about this issue covering many different aspects without being single-sided. Hopefully this discussion will continue when they are all back in their home countries. Give us some feed back from time to time how things are progressing in that debate in the SEE countries. The Europe House will stick to the topic of future enlargement. Already in September we will have a multinational youth gathering which will deal exactly with this topic. As we will multiply a lot of the experiences via Social Media it could be a good opportunity for you to be engaged as well. Feel free to contact us! Smart Dictators – One of the main reasons for the implementation of Social Media in Political Education! This is why we are so concerned about political (non-formal) education and the implementation of social media. The article was published in the Sueddeutsche Zeitung (Kluge Diktatoren) this weekend and it very well illustrates why we should increase our efforts to implement and explain social media in the field of political education. The author of this article is Evgeny Morozov (author of the book “The Net Delusion” – one of the most cited works when it comes to Internet and Democracy). The Article deals with the question why not Internet-censorship but containment constitutes a true danger for democracy. To read the full article you can either click on the picture itself and enlarge it to original scale or you click on the following link and downlaod the PDF file from our ge.tt account. Veröffentlicht am 14. 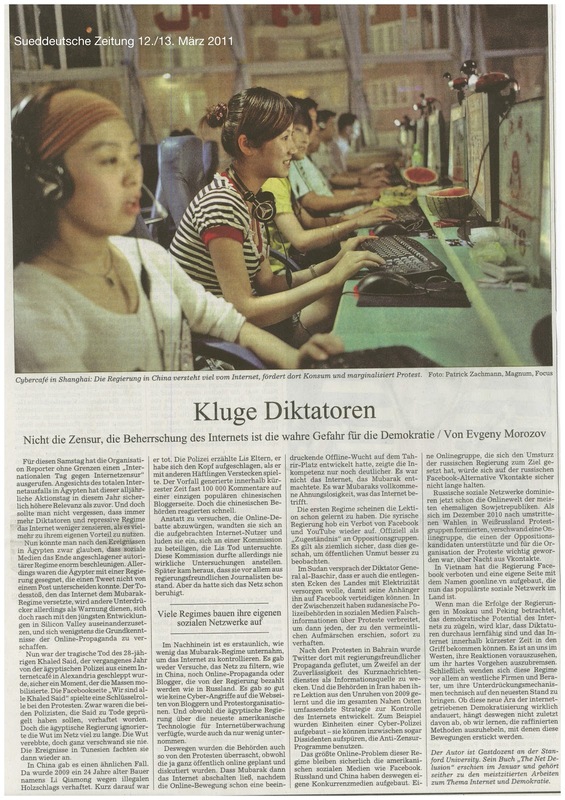 März 2011 Autor KarstenKategorien Press & Media reportsTags newspaperSchreibe einen Kommentar zu Smart Dictators – One of the main reasons for the implementation of Social Media in Political Education! We have previously informed you about the planned EU sanctions against Moamer Kadhafi – Here is the update on that! BRUSSELS, European Union sanctions against Libya’s Moamer Kadhafi, his family, and leaders of his beleaguered regime accused of brutalising civilians, came into force on Thursday. A list of the 26 Libyans targeted by the 27-nation bloc published in the daily EU Official Journal signals the immediate enforcement of an asset freeze and visa ban agreed Monday. Aside from Kadhafi, the measures apply to his seven sons and his daughter, along with his wife Safia al-Barassi. Kadhafi’s brother-in-law Abu Shaariya, deputy head of Libya’s external security, as well as two of his cousins, Ahmed Kadhaf al-Dam and Sayyid Kadhaf al-Dam, suspected of “terrorist activities”, arms dealing and involvement in assassination bids against dissidents living abroad, are on the list. The list gives names, dates and places of birth as well as job descriptions and reasons for being targeted by the sanctions, as well as passport numbers in a few cases. Also targeted are armed forces chief Colonel Massud Abdulhafez, anti-terrorist chief Abdussalam Mohammed Abdussalam, military intelligence director Colonel Abdullah al-Senussi and his deputy, Al-Barrani Ashkal, as well as the head of Libya’s revolutionary committees, Omar Ashkal. Kadhafi’s personal security chief Abdulqader Yussef Dibri, and Defence Minister General Abu Bakr Yunis Jaber are also on the list. The EU sanctions, which were adopted with unusual speed and rare cohesion, also called for an embargo on arms sales to Libya, in line with a UN resolution adopted last weekend. 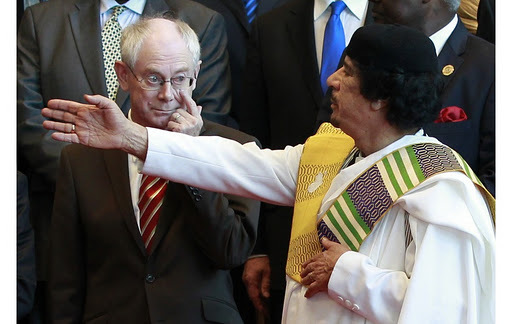 But toughening up the UN measures, the EU added names to the UN list and also slapped an embargo on sales to Libya of equipment which might be used for internal repression. The bloc is currently eyeing added sanctions to hit Libyan companies. And also: This is Reuters latest News on the current developments in Lybia and the actions the EU is considering, i.e. Taking at the moment. BRUSSELS, March 6 (Reuters) – The European Union dispatched a fact-finding mission to Tripoli on Sunday charged with reporting back on humanitarian and evacuation needs there to an EU crisis summit on Libya this week, an EU statement said. The team, headed by the head of EU crisis management, Agostino Miozzo, left for the Libyan capital from Rome on an aircraft provided by the Italian government. “Its aim will be to assess humanitarian and evacuation efforts on the ground in Libya to make an appraisal of what may be needed in terms of additional support,” the statement said. It said it was the first such international mission to the country since the recent violence erupted there. EU foreign policy chief Catherine Ashton has called a meeting of EU foreign ministers in Brussels on Thursday to discuss the EU response to the crisis in Libya ahead of a summit of European leaders that will focus on Libya on Friday. “I have decided to dispatch this high level mission to provide me with first-hand, real-time information to feed into the discussions leading up to Friday’s extraordinary European Council when I will update Heads of State and Government on the situation,” Ashton said in the statement. An EU diplomat stressed that the aim of the mission was to gather facts, not to negotiate with the Libyan authorities. “We have people on the borders, but nobody on the ground in Libya to find out what’s going on,” the diplomat said. “We are not there to negotiate, but to listen, and find out what’s going on the ground.” Intense automatic gunfire erupted in Tripoli on Sunday, the first such outbreak in Muammar Gaddafi’s main stronghold in a two-week-old insurrection against his 41-year-old rule. Government spokesman Mussa Ibrahim denied any fighting was under way in the capital, saying the gunfire was to mark the army’s recapture of several cities from rebel forces. “The EU has currently no formal relations with Libya, and the Commission has no Delegation in Tripoli. Nine EU Member States have embassies in Tripoli, and increased focus is being given to Libya following the lifting of the UN sanctions.On the basis of a consensus among the 27 Euro-Med partners reached on the occasion of the third Euro-Med Conference of Foreign Ministers in April 1999 in Stuttgart, Libya can become a full partner of the Barcelona Process if she accepts the full Barcelona acquis. Press freedom has improved. However, freedom of association and freedom of expression remain restricted and there are still numerous reported abuses of human rights. Recently, many Islamic prisoners were freed and the government has taken steps to grant compensation to victims of the 1996 repression at the Abou Salim jail as well as to destroy this prison, a symbol of internal repression. The Leader of the Revolution, Muammar al-Gaddafi, still retains strong influence.“[Read the whole EEAS Strategy Paper on Libya here]. 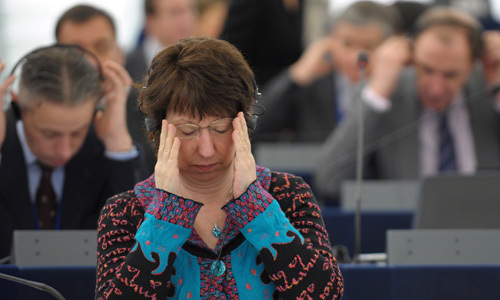 Catherine Ashton and the EEAS are facing a great challenge. 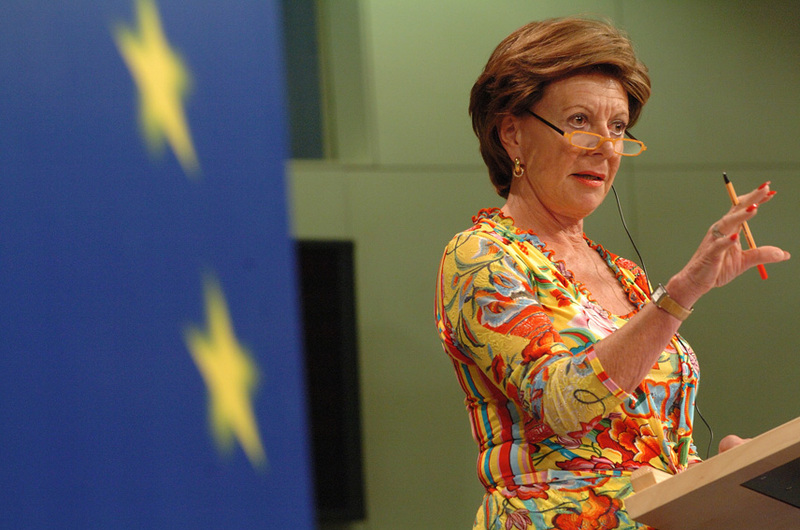 The role of the EU in matters of foreign affairs is going to be (re-)defined, especially by the actions the EEAS is going to take now that many Arab countries are heading for change – change that will need careful and deliberate support. Now, with the Maghreb Countries unsettlement, the past strategies will have to be reconsidered and modified – the EEAS will have to prove its ascribed raison d’être. Breaking News: The European Presidecy has just announced the launch of 2011s year of Volunteering website. I guess it’s time for us to volunteer and go abroad or stay and join the voluntary work! We will provide all the information we can get a hold of on this blog – so stay tuned and be amazed by the wide range of possibilities the EU offers! This is no commercial! We are aware of all the discourses that shed a negative light on the EU. But where there is shadow, there has to be light and this certainly is shining bright!